Add a hint of color to any display with Quartet Magnetic Push Pins. The colorful push pins fasten to any steel surface to securely hold up to 6 sheets of paper, creating an instant bulletin board. The round translucent tops add a stylish touch to this functional tool. A convenient, clear plastic package stores all 20 push pins. Brightly colored pins in lively red, blue, green, yellow and purple plastic accent messages. These are Quartet Magnetic Push Pins! They come in five fairly bright and transparent colors. You can place them onto virtually any magnetic surface and hold about 6 sheets, like on this magnetic classroom whiteboard. Besides the obvious, you can have some fun with them. Like make your own version of a magnetic dart board! And since this is myBINDING, you can even put them on metal wire binding! Exciting, I know. Or if you take two that are polarized the same, they will repel each other, so holding them close to each other and then letting go will makes them shoot off! So, no you are not just buying magnetic push pins, but a new way to push your creativity! Thank you for your question. 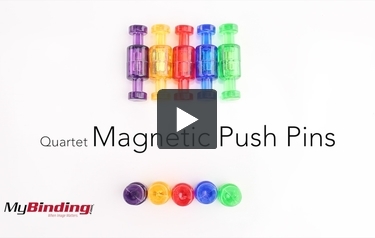 Unfortunately the Quartet Magnetic Push Pins are only available in the colors in this pack. Those colors are red, blue, green, yellow and purple.